Doreen Rappaport, Chronicle Books. Ages 9-12. This is the second book in a powerful trilogy of the African-American experience. 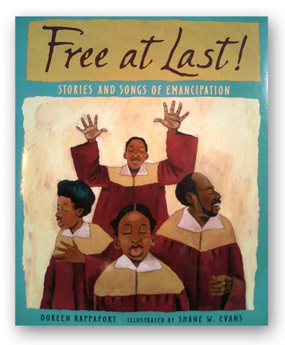 Free at Last chronicles the difficulties that America, and black people in particular, faced post-slavery. America’s chilling realities are brought to life in these paintings in an effort to show readers the hard path that many blacks traveled to advance as a people.